Ten months after Dropbox first unveiled Paper, the collaborative writing tool entered open beta on Wednesday and is getting mobile versions for iOS and Android. Paper allows teams to work on documents together in the cloud. It makes it easy to add text, images and embedded videos from YouTube, Google, or Dropbox itself. Users can also add programming code, which gets formatted automatically. 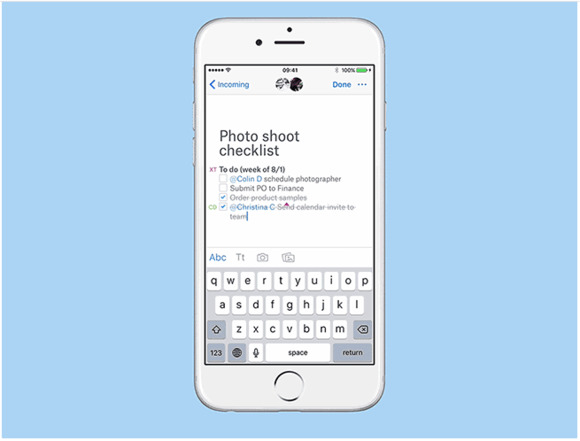 And they can create to-do lists and assign tasks on those lists using the @ symbol. Since its debut in private beta, Paper has been used to create more than a million documents for tasks like brainstorming ideas and capturing meeting notes, Dropbox said. Based on lessons learned along the way, Dropbox has improved the software with better tables and image galleries, more powerful search, and notifications via desktop and mobile. The new apps for Android and iOS, meanwhile, let users get project updates, make edits, and respond to feedback from their mobile devices. "As Dropbox tries to expand the concept of what it is, it's only natural that they dig deeper into the productivity tool bag," said T.J. Keitt, a senior analyst with Forrester Research. "Paper gives them a collaborative content engine that lets teams work collectively on lists and notes -- a useful tool given information workers have scooped up note-taking tools like Evernote and OneNote for similar purposes." Competitors like Box, Google and Microsoft offer similar tools, so Dropbox needed Paper to keep up, Keitt said. "I don't think this will be a great point of differentiation for them." Paper is "definitely a cool product," said Melissa Webster, a program vice president with IDC. It's essentially Dropbox’s answer to Google Docs but designed to be more visually appealing, Webster said. "Word processors have historically been poor at supporting creative teams and concept work that is visual," she said. "Dropbox Paper should appeal to marketers, creative folks, product teams and others who find traditional text-oriented word processors and note-taking apps somewhat confining." The beta program for Dropbox Paper is now open online. The associated mobile apps are available in the U.S. from the iOS App Store and Android Play Store, and are coming soon for users in the EU.